True efficiency rewards you with our 2018 Toyota Camry LE Sedan offered in amazing Attitude Black Metallic. Powered by a 2.5 Liter 4 Cylinder that produces 203hp while paired with an impeccable 8 Speed Automatic transmission for quick acceleration. 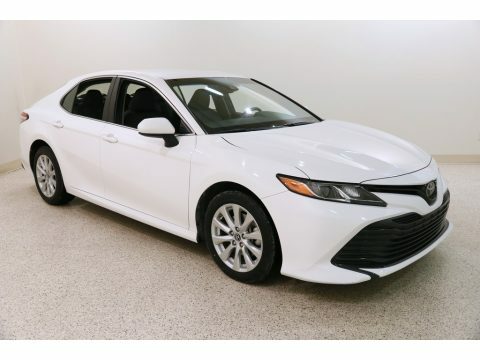 Impress yourself and put this Front Wheel Drive Camry to the test on the open road while seeing nearly 39mpg. With a beautiful combination of athletic and graceful body styling, you will be immediately attracted to the Bi-LED automatic headlights, alluring alloy wheels, and bright LED taillights.Slide into your comfort zone of our Camry LE and take a seat in the fabric-trimmed seats as you savor ergonomically designed features including a 7-inch touchscreen display, Entune 3.0 Audio, Bluetooth, and a wonderful six-speaker sound system with steering wheel mounted controls. You'll also appreciate remote keyless entry, cruise control, a rearview camera, a tilt-and-telescoping steering wheel and split-folding rear seats. Stunning looks, amazing handling, the newest technology and the roomy interior make this Camry an absolute joy to own.This Camry from Toyota has an abundance of safety features including Anti-lock brakes with brake assist, stability control, and an army of 10 airbags combine to safeguard you in this impeccable Toyota with a sterling reputation for reliability. Enjoy this smooth quiet ride! Print this page and call us Now... We Know You Will Enjoy Your Test Drive Towards Ownership!